Ah, Chinese New Year. A time to get together with the family and eat, chat, eat a lot of Chinese New Year snacks, and maybe wash them down with a nice refreshing beer. This year, why not spice up your Chinese New Year sessions with some craft beer instead? After all, two beers from the acclaimed Brooklyn Brewery are now easily available in Malaysia, namely the Brooklyn Lager, an American amber lager in the “Vienna” style, and the Brooklyn East IPA, which is an approachable and balanced IPA. Thirst Mag has also been collaborating with Brooklyn Brewery to pair the beers with some of the best food from selected restaurants around town. These include local barbecue hotspot Burnin’ Pit in Desa Hartamas, KL eatery Curious Kitchen, MEJA Kitchen & Bar at Sunway Velocity, and the elegant SARO Lounge at Pavilion Elite. The most recent one was at Brooklyn TGG Arkadia, one of only two outlets in Malaysia which serve Brooklyn beers on tap. The event paired five specialities featuring diverse South-East Asian flavours with the signature Brooklyn Lager and the hoppy Brooklyn East IPA. The beers are also available on tap at the Brooklyn Bar at High Line Rooftop Market, Resorts World Genting, and by the bottle at retail outlets such as Ben’s Independent Grocer, Isetan, Jason’s Food Hall, Jaya Grocer, Mercato, Oliver Gourmet, and Village Grocer. 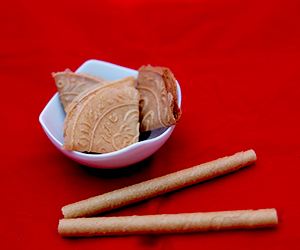 A traditional snack that comes in a fan-shape or rolled up like, well, love notes, with its flaky texture and light sweetness making it a perennial favourite during CNY. This a pretty good pairing with the Lager, as the more citrusy and lighter bitterness of the beer actually complements the slight sweetness and light texture of the snack. Some say these look like ears (hence the name), others say it looks like little pointy hats. 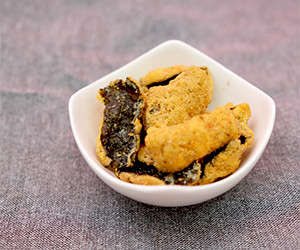 They may not look like much, but you can file these brown little nuggets of crunchy delight (usually flavoured with Chinese five spice) under snacks that you just can’t stop eating once you start. The lager goes best with the softer flavoured snacks, the ones that are sweet but not TOO sweet like the kueh kapit, or savoury but not TOO savoury, like this one. 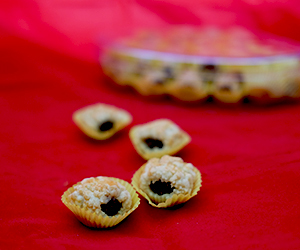 Who doesn’t love pineapple tarts? 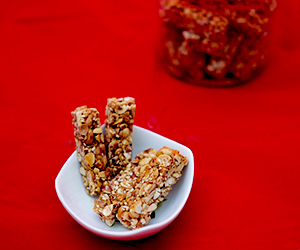 The lovely flaky, crumbling crust enveloping that savoury sweet filling that fills your mouth with honey pineapple goodness... There’s a reason why it’s one of the most popular CNY snacks EVER. We already know that the lager goes well with soft crusty snacks like love letters, but it also melds perfectly with the pineapple in the tarts. The sweet sourness of the pineapple goes nicely with the softer bitterness of the lager, and the flakiness of the crust also adds nice creaminess to the beer. 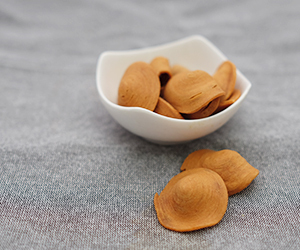 From peanut cookies to peanut butter-flavoured love letters, to actual roasted peanuts, peanut-related snacks are actually pretty common during Chinese New Year. For the purpose of this pairing, we’ve decided to go with another favourite of ours – peanut candy. You know, the bars of peanuts held together by a layer of sweet brown sugar that practically melts in your mouth? Yeah, those. The general consensus after this pairing session is that the IPA doesn’t go too well with snacks that are sweet, as it messes with the balance of the beer’s hoppy flavours. But with the lager, the lower level of bitterness works better in its favour, as it does with the peanut candy. The peanuts also complement the hint of nuttiness we sometimes get from the Lager as well. The name literally means ‘dried meat’ – it’s actually dried preserved meat, usually pork, but sometimes made with beef and chicken, usually grilled over charcoal. 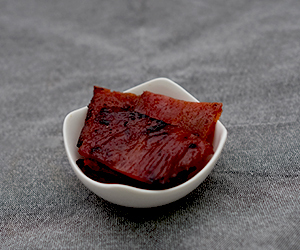 Bak kwa in Malaysia has a sweeter, slightly smokier flavour to it than the ones found in other countries. The stronger hoppiness of the East IPA goes really well with the sweet, salty savouriness of the bak kwa, while the refreshingly hoppy citrus notes also help to cut through the stronger smoky, fat flavours of the meat. 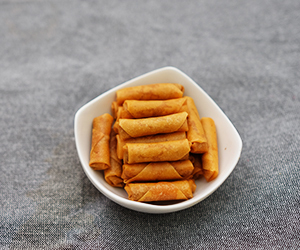 These little cylinders of rich, spicy and savoury shrimp goodness are one of the more unique CNY snacks we’ve got in Malaysia. They aren’t sweet like many of the other snacks, but you just can’t stop eating them once you start. It’s also the perfect beer food, because that spicy kick in your mouth is just begging to be washed down with a nice cold brew. While the Brooklyn Lager works well as that refreshing after-snack beer, flavour-wise, the East IPA’s stronger hoppiness shines through the spiciness and the rich savouriness, adding a more complex layer of flavours to the snack. Salted egg is all the rage these days, with people putting it on everything – salted egg fish skin, salted egg mooncakes, salted churros, even salted egg cakes. So, we couldn’t really leave it out, could we? For this pairing, we managed to get our hands on some salted egg encrusted seaweed, which sounds strange, but is really quite yummy. The salted egg flavours actually went pretty well with the IPA – the snack’s saltiness and the beer’s bitterness may seem like strange bedfellows but the seemingly contrasting flavours actually helped to create an interesting combination of sweet, sour, salty and bitter. 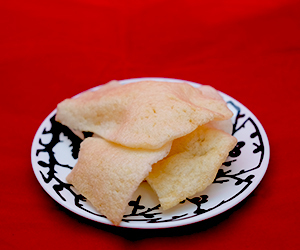 Crackers and keropok are generally quite decent bar snacks, as the crispy dryness automatically makes you want to reach for the nearest beer. To be honest, the flavours in the crackers were just too light to make much of a difference to the stronger flavours of the two beers. But like we said, crackers go well with pretty much any beer, so in this case, we’d suggest you go with any beer, as long as it’s a Brooklyn beer!